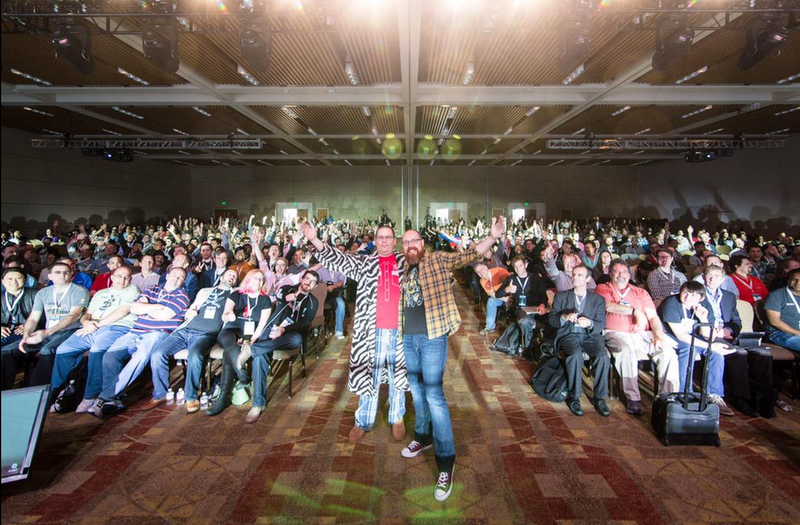 ChefConf 2015 is a wrap, and most of the community has returned home. For those of you not familiar with the conference, it's the gathering of hundreds of Chef community members. We get together to learn about the latest and greatest in the industry (both the hows and the whys), as well as exchange ideas, brainstorm solutions, and give hugs, which has become the calling card of the DevOps community, and the Chef community in particular. As a result, every ChefConf and Community Summit feels like a reunion, which is awesome, but that also means that leaving feels a bit like the end of summer camp, where you go home with your camp high and all of your resolutions to keep in touch with your new friends, only to realize that it's a lot harder than you thought it would be. Find your local community. Take a look at devops.meetup.com to see what Chef-related meetups are in your particular corner of the world. If there aren't any, look into Ruby meetups or other language-specific meetups to find the one that might fit you. Still can't find a meetup in your area? Talk to me if you're interested in starting your own— we're more than willing to help with sponsorships! Follow the #DevOps and #hugops hashtags on Twitter. Twitter can be a great way to connect with people who have similar interests, and engage in conversation. I've met some fantastic people, learned about cool new products and conferences, and found countless new blogs simply by keeping an eye on these hashtags. Engage on IRC. I have to admit, I don't spend a lot of time on IRC, but I do know that when the Chef community gathers at #chef-hacking every Thursday from 9–10am PT, the conversations are great, a lot gets accomplished, and it's a good place to be. Not on IRC? Try out Slack. Slack communities have been gaining ground lately, and the hangops crew started one recently as well. Join in to talk about ops, ask for help, and connect with others in the ops community. Join us for Office Hours. Need some help with Chef or just want to say hi? Catch us on Google+ every week on Monday and Wednesday from 12–12:50pm PT. Follow @ChefOfficeHours to get the links each week. Take time for yourself. Make sure you have the time to decompress, process, and reenter "reality." I know it's hard to do when we've all just taken time out of our work week to attend the conference, and that it seems impossible to do when we have piles of emails and to-do lists looming, but trust me… it's important. It's perhaps even the most important thing you can do. Take the time. It's worth it, and if you work for a company (or a manager) worth its (their) salt, they'll agree. Lastly, as Community Builder at Chef, I'm always willing to help in whatever way I can… whether that's offering virtual #hugops, meeting up with you when I'm in town, or connecting you with other community members in your area. So I'm issuing a challenge: until the next "reunion," let's stay connected, both online and in person, and keep the community vibe going even when we aren't all together. Join your local meetup, or start one of your own. Sign up for the hangops Slack group and say hi on Twitter.